Hoardings are a cost effective means of advertising the outdoor, they can draw great attention to the visitors and make a huge impact on prospective customers. That is why more and more businesses use hoardings for marketing and promotion of their products and services. It is a creative and powerful option to keep the important message that is the products and services has to be highlighted. They intend to attract the people. These advertisements are conveyed mostly with the help of diagrams or pictures, we at largeformat-print try to make minimum use of words so that the viewers quickly grasp the message you want to convey. The message should be simple and short, so that it should be visible through distance. The text included should be highly visible, attractive font to boost up the effectiveness. The hoardings can be used for short term and long term purposes and are cost effective; they can be placed on roadsides, construction sites, station platforms, malls, ports and other strategic locations. The main benefits of using hoardings are unlimited, as they are used to create brand awareness, frequent and continuous highlighting of message and for effective product exposure. They are not used by the businesses only but they are ideal for promoting awareness like AIDS, poverty eradication, environment related etc. Vibrant colors: we create all kinds of prints in vibrant colors to grab the attention of the visitors. Use of more graphics that the text is very effective in conveying the message, even illiterate people can grasp the anticipated message. Vibrant colors can be seen from a distance. Large size: this medium of advertising is used to make it visible to large number of people even from far distance. Being large, the hoardings have huge impact on the people passing by. 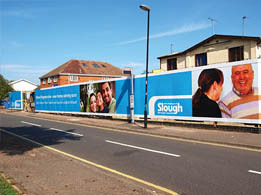 Hoardings look eye-catching with white background and contrasting graphics. Attention grabbing tag line and welcoming information about the products would create a positive image in the mind of the viewers and would last for a long time. Customized solutions: The designers at large format print can be customized hoarding according to the requirements of the clients. The size and shape of the hoarding and other large display banner can be created suiting the place and the event. Vibrant colors in the hoarding can catch the attention of the viewers. Currently in fashion: The hoardings and flex banners are in fashion these days. Most of the advertisers use this medium to convey their message to large audience. We offer different materials to design the display materials to our clients all over the UK. It could be designed with materials like acrylic, plastic, polycarbonate, fabric, etc. The flex boards or hoardings can be used for indoor as well as outdoor purpose. A variety of hoardings are available at large format print according to their thickness, tear strengths and UV resistance. These are available in a variety of pigment colors that can be used for digital printing, silk screen inks. The hoarding can be used for short-term as well as long-term displays on the roadside, flyovers, malls, airports, construction sites and various other locations. These can create brand awareness among the viewers and great exposure to the products viewed as the advertisements. 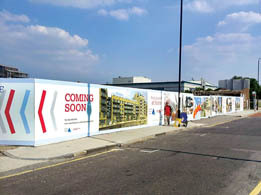 Well-designed hoardings can lead to increased return on investment. You can spice up your advertisement with catchy lines and creative graphics. The print medium plays a vital role in building brand; the print advertisements create word of mouth among the other campaign organizers. Large format print has experienced staff to create such advertisements for your company or brand. We have the ability to represent your brand in an innovative manner. Contact us to get the best display designs for your promotional campaigns.